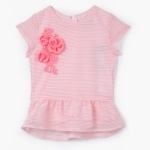 Stylish and elegant, this textured peplum top makes a closet staple. It comes with an all over striped pattern adding to its charm. The contrast floral embellishments at the front are the design highlight.